I continue to write the regular ‘Briefing’ slot in the Sunday Times’ comment section most weeks. 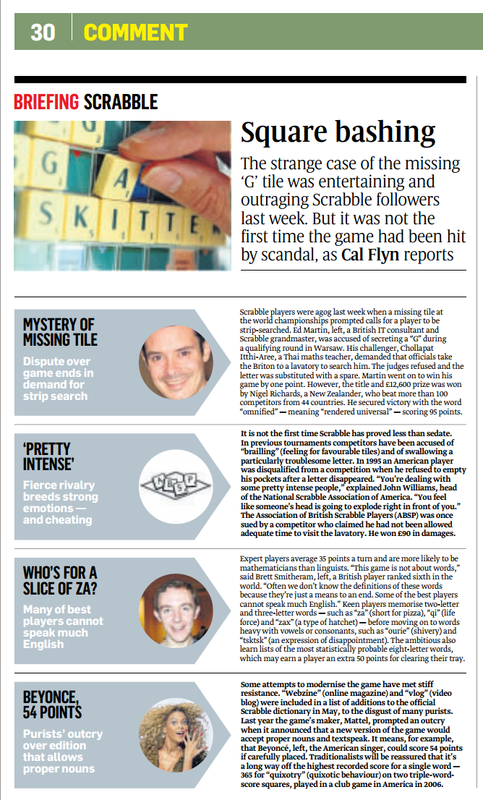 This week I wrote about the scandal hitting the Scrabble world, after one grandmaster accused another of cheating and demanded he was strip-searched. I quickly learnt that many Scrabble champions speak English as a second language – or indeed, speak no English at all – instead using their superior understanding of probability to calculate the most likely and best scoring letter combinations, before committing them to memory. Then the three letter words, then longer words using the most common letter strings.